Over the years, Lueshand Nunn, board president of East Bluff Neighborhood Housing Services (EBNHS) Inc. in Peoria, Illinois, has received numerous donations to benefit the work of EBNHS. Many donations are in cash, usually less than $100. Sometimes, a donation of products is given to support the neighborhood. This past spring, however, EBNHS received an unusual donation–a house in the neighborhood. Nunn was contacted by the Heimberg family offering to donate a house to EBNHS if it could be put to use helping the East Bluff neighborhood residents. The Peoria home, located at 1825 New York Ave., was previously owned by Michael Heimberg, who recently passed away. Heimberg was a veteran who often helped neighborhood residents with car repairs in his large garage. Nunn immediately visualized the home becoming a neighborhood youth center and the garage was the perfect place to house EBNHS’s Law’n Order program. Law’n Order is a summer work program, providing jobs to neighborhood youth mowing yards throughout Peoria. EBNHS holds a contract with the City of Peoria to mow vacant lots and other residences which are not being maintained according to city codes. Over the past three years Law’n Order has grown and, currently, more than 300 Peoria lots are maintained by East Bluff neighborhood youth through the program. Five mowing crews consisting of 40 participants maintain the grass on these lots, eliminating potential eyesores and unsafe areas in the neighborhood. In addition to providing summer income for the youth, the program also teaches the workers important money management lessons. Workers are required to place half of their income into their bank account each payday. The saved funds are to be used for school-related items or other necessities. This successful program has a waiting list of 150 youths who want to join a mowing crew. The Law’n Order program requires a fleet of lawn mowers and space to repair and store them. The large garage at the donated house, once used to repair and maintain automobiles, will become a repair shop and lounge for the youth workers. The interior walls of the garage were unfinished drywall. Nunn had an inspiration to create a mural on one of the walls, dedicated to Michael Heimberg. EBNHS is one of the community based organizations working with the Peoria Teacher Education Pipeline program. Nunn worked with Cliff Cobert, PTEP associate director to plan many of the activities for Peoria STEP-UP, ISU’s summer fellowship for aspiring educators. 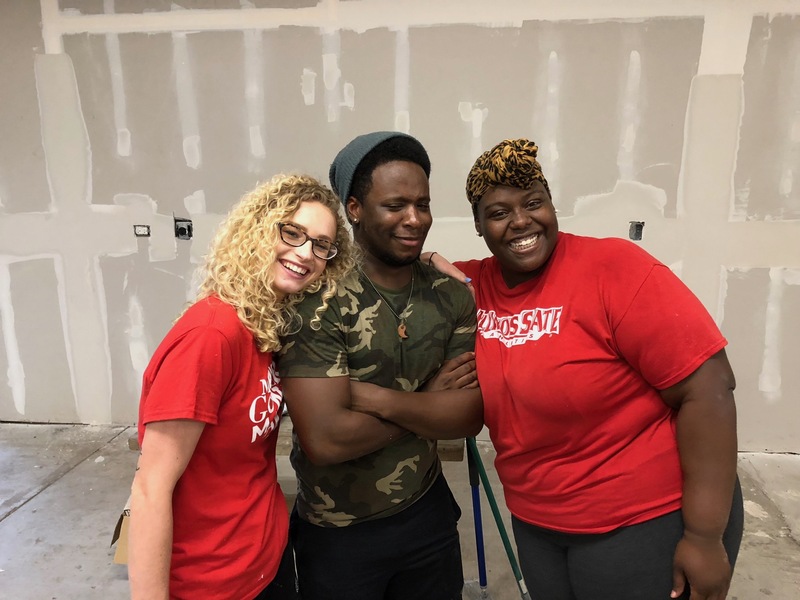 During the June STEP-UP program, ISU Fellows Erika Barber, Traevon Parnell, and Ranija Turner, performed a service learning project, working at the garage. The Fellows applied joint compound, sanded and primed the wall in preparation for the planned mural. Erika Barber, a senior art major, is also charged with designing and painting the mural. Since the completion of STEP-UP on June 29, she has been working on the mural. Some of the Law’n Order workers are assisting Erika in painting the mural, providing an opportunity for them to ‘put their mark’ on the renovated space. An open house is planned for 10 a.m., Saturday, August 25, when the mural and other renovations at the house will be unveiled to the neighborhood. Lueshand Nunn can be contacted at (309) 685-3066 or lnunn.ebnhs@gmail.com for additional information about EBNHS and the Law’n Order program.